Thanks to the presence of a natural "zoom lens" in space, Hubble Space Telescope got a uniquely close-up look at the brightest "magnified" galaxy yet discovered. This observation provides a unique opportunity to study the physical properties of a galaxy vigorously forming stars when the universe was only one-third its present age. A so-called gravitational lens is produced when space is warped by a massive foreground object, whether it is the Sun, a black hole, or an entire cluster of galaxies. 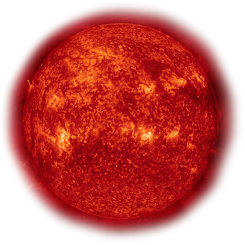 The light from more-distant background objects is distorted, brightened, and magnified as it passes through this gravitationally disturbed region. 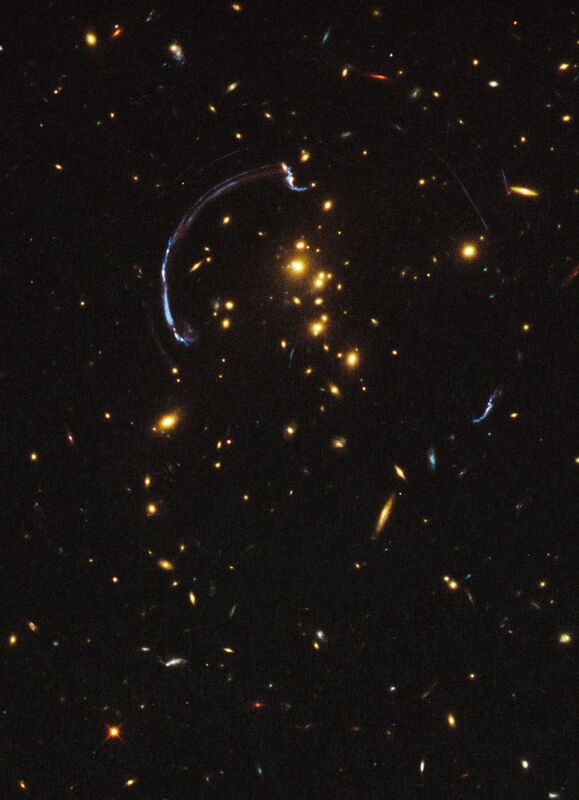 A team of astronomers led by Jane Rigby of NASA's Goddard Space Flight Center in Greenbelt, Md., aimed Hubble at one of the most striking examples of gravitational lensing, a nearly 90-degree arc of light in the galaxy cluster RCS2 032727-132623. Hubble's view of the distant background galaxy is significantly more detailed than could ever be achieved without the help of the gravitational lens. The results have been accepted for publication in The Astrophysical Journal, in a paper led by Keren Sharon of the Kavli Institute for Cosmological Physics at the University of Chicago. Professor Michael Gladders and graduate student Eva Wuyts of the University of Chicago were also key team members. The presence of the lens helps show how galaxies evolved from 10 billion years ago to today. While nearby galaxies are fully mature and are at the tail end of their star-formation histories, distant galaxies tell us about the universe's formative years. The light from those early events is just now arriving at Earth. Very distant galaxies are not only faint but also appear small on the sky. Astronomers would like to see how star formation progressed deep within these galaxies. Such details would be beyond the reach of Hubble's vision were it not for the magnification made possible by gravity in the intervening lens region.